A group of about 30 people gathered at the main trailhead at Logandale Trails area on Saturday, Oct. 28, to celebrate the completion of a long-time goal. Representatives from the BLM, Partners in Conservation (PIC), Clark County and the Nevada Off-Highway Vehicles (OHV) Commission attended an opening event for two newly constructed visitor restroom facilities at the large trails area just west of Logandale. Earlier in the morning, volunteers had gathered at the site and done a cleanup of the trails area. Assisting in this effort were members of the Vegas Valley 4-wheelers organization who were also doing advance prep work for their upcoming Hump N Bump event which will take place this weekend on the trails. A brief grand opening ceremony was then held at the main trailhead at about 11 am. The restroom buildings began construction late last spring and recently came to completion. They were funded by grants from the Nevada State OHV Commission and the federal Recreational Trails Program. McAllister was instrumental in writing the grants and overseeing the projects. The new restroom at the main trailhead cost about $100,000 in grant funding from Nevada OHV Commission. A second restroom facility, further down the road in the lower part of the trails system, cost about $85,000 in Recreational Trails Program grants to complete. Sue Baker, one of the nine commissioners of the Nevada OHV Commission, said that the opening was an exciting first step forward for the Commission. She pointed out that the Logandale Trails main trailhead restroom building was the first project funded and completed by the state grant. The grant program is funded by OHV registration fees in the state. BLM Assistant Field Manager Shonna Dooman, of the Las Vegas Field Office, said that the need for the new facilities at Logandale Trails had been the subject of discussion for many years, but had taken a long time to complete. She recognized McAllister and the Partners in Conservation organization for their stewardship and cooperation in managing the trails area. “PIC has been an amazing partner I am excited to work with you on a daily basis,” Dooman said. Dooman added that other improvements were also in the works for the Logandale Trails system. The BLM is working with McAllister on writing additional Nevada OHV Commission grants for new shade structures, picnic tables and trash receptacles at the main trailhead area, she said. PIC board member Gene Houston, who also serves on the Moapa Valley Town Advisory Board, said that the project went along perfectly with the foundational goals of PIC. Attendees gathered at the entrance to the new restroom facilities for a brief ribbon cutting ceremony. Then they enjoyed a picnic lunch together provided by PIC with pizza donated by Pirate’s Landing in Logandale. The Logandale Trails area is visited by more than 200,000 people per year. According to visitor surveys taken in the area, about 25 percent of those visitors are new to the area. The new buildings replaced older facilities which were built more than 25 years ago and were nearing the end of their lifespan. St Thomas was a pioneer settlement starting in 1865, located approximately 7 miles southeast of Overton, NV, inside the Lake Mead National Recreation Area. It was flooded over in 1938 with the construction of the Hoover Dam. Because of the decreasing water levels of Lake Mead in recent years, the water that once covered this historic site is gone, and more and more of the original settlement is visible and accessible. Starting as a pioneer settlement in 1865, St. Thomas grew to be an established town of farms, homes, and stores. It was originally settled by a parry of 45 Mormons led by Thomas Smith. The group was originally sent by Brigham Young to grow cotton and open a supply route to Utah via the Colorado River. In the early days, it was a key supply stop along the Old Mormon Corridor from Utah to San Bernardino, CA. By the early 20th century, St. Thomas was as big a town as Overton, and much bigger than the ‘then new’ city of Las Vegas. It was a bustling mining and farming community with as many as 20-30 horse-drawn flatbeds of copper and gold ore coming through town each day. The pioneers soon learned that this was a difficult place to establish a settlement. They had to contend with the intense heat, malaria infested mosquitoes, and scorpions. After digging miles of irrigation canals, they found the cotton didn’t grow well. Conflicts with local Indians further increased the difficulties faced by the pioneers. After a 1870 Survey established St. Thomas as being part of Nevada (the residents and Brigham Young thought St. Thomas was located in Utah or Arizona), and they were presented with a tax bill from Lincoln County, Brigham Young allowed the settlers to return to Utah in 1871. One resident, Daniel Bonelli, decided to stay. After 1871, St. Thomas was taken over by other settlers, including outlaws and other people trying to hide out. Between 1880-1900, several Mormon settlers returned to St. Thomas, as well as other settlers. A variety of crops were planted and cultivated, including cotton. Salt was mined and shipped to St. George and other mining areas. The settlers benefited from of the position of St. Thomas on the main road between Los Angeles and Salt Lake City as a key route to ship crops and goods. With the discovery of gold and copper in the areas east and south, mining became a booming business, and St. Thomas became a freight stop on the Spur Line of the San Pedro Los Angeles Railroad for ore, goods, and produce. The Arrowhead Trail, or Arrowhead Highway, was built mostly during the period of of the 1910’s, it was the first all weather road that connected Los Angeles to Salt Lake City, via Las Vegas. This was, of course, before the US established the numbered highway systems. In 1926, the Arrowhead Trail was replaced by US Route 91, and later Interstate 15. Presently, there are still some portions in California and Las Vegas that are referred to as the Arrowhead Trail or Arrowhead Highway. By 1918, there were 6 established businesses in St. Thomas: Gentry’s Store, R. Hannig Grocery Store, Gentry Hotel, William Sellers Cafe, Howell Garage, and Rox Whitmore Meat. The community was thriving, having established itself as an early ‘tourist attraction’. Motorists driving through found it a welcome place to stop for food, supplies, and if needed, car repairs. Just a few short years later, the fate of St. Thomas began to look bleak. The price of copper declined, the exports through the railroad decreased, and when the Virgin River Bridge burned, Highway 91 was rerouted north of Moapa Valley across Mormon Mesa. More ominous of course, was that surveying and test drilling for a new dam began in Boulder and Black Rock Canyon. By 1926, plans for building the Hoover Dam had already been in place, and government appraisals for the holdings in St. Thomas began. Residents fought the government and were not happy with the low payments for their properties. Many of them never really believed the waters would rise so high after the dam was built. By the summer of 1932, all holdings in the settlement were the property of the U.S. Government, and by 1938, the entire town was covered by the newly created Lake Mead. Before the town was fully submerged, some homes were moved, and other structures were taken apart and pieces salvaged to build in other communities. The St. Thomas Cemetery was moved in in 1935, the graves and remains located to the present day St. Thomas Cemetery. Many of the residents of St. Thomas moved to what is now the Moapa Valley, including the towns of Overton and Logandale. 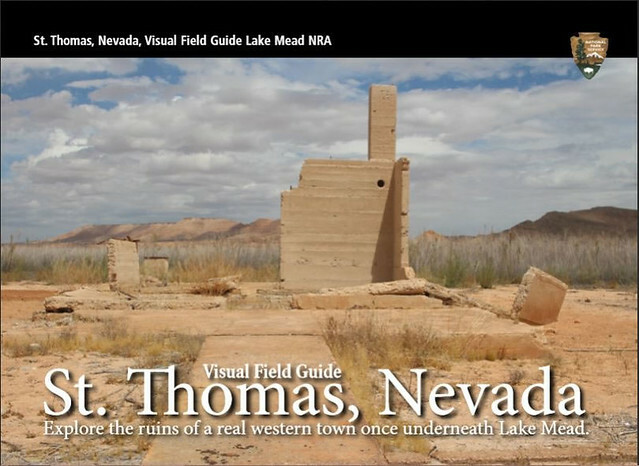 The remains of St. Thomas are visible again since the waters of Lake Mead began receding in 2003. The National Park Service has cleared a path from the parking area down to the site. It is about a 3/4 mile walk to the remains. There are a few steep slopes and much weed and bushes to negotiate, please use caution! The entire area of St. Thomas is under the jurisdiction of the National Park Service, and you must obey all NPS rules and regulations. Metal Detectors are not allowed, and you may not remove any objects from the area. Please leave all remains exactly the way you see them, as work is still continuing on identifying items and locations. The are can be hazardous due to overgrowth and objects projecting from the ground. Step cautiously and do NOT climb on any remains. While we cannot bring St. Thomas back to life, we can show the town and its people the respect we’d like our home town to receive. Please do not climb on foundations or disturb any artifacts you find. These remnants remind us of the people of St. Thomas, those who played, worked and lived here. In February 2012, three companies of Moapa Valley “pioneers” dragged, pushed and hauled 30 loaded handcarts from Logandale on a trek down the Muddy River to St. Thomas in a brief but accurate depiction of the struggles of the earliest Mormons crossing the Great Plains. Between 350 and 400 people participated in the handcart trek included more than 250 members of the Logandale LDS Stake Young Men’s and Young Women’s groups, according to Willie Frehner, second counselor of the Logandale LDS Stake presidency. Read the full story in the Moapa Valley Progress. 2. Exit Hwy 169, N Moapa Vally Blvd. 5. Park Entrance is approximately 17 miles from Interstate 15. Park entrance fee is $10 per vehicle. 6. Immediately past the entrance is a left turn onto St. Thomas Road. Follow approximately 3.25 miles. 2. In Boulder City Follow 93/95 to Lakeshore Rd. 3. Turn left on Lakeshore; Park entrance fee is $10 per vehicle. MAPS: The National Park Service has created a great interactive guide: The St. Thomas Visual Field Guide is an interactive guide to help you as you visit the streets of this historic town, with photos and maps for reference. Map and directions on this page courtesy of the National Park Service.